You can find the part I here. If you read the Quran and Hadits, you will realize that the entire core doctrine has been based on viparit buddhi right from the start. This is not a temporary distortion of Islam, as Mindus suggest or think. Islam has always been this way. In fact, the only good people you consider to be good Muslims are those Muslims who have strayed away from the true doctrine of the book. That’s the paradox: A good human being is technically a ‘bad Muslim’ who doesn’t follow the path prescribed by the Hadits. And the Hadits are pretty unequivocal in stating that a Muslim should not intermingle with kaffirs as “that is how the kaffir propagates his culture and pollutes the mind of a pious Muslim”. Interestingly all these examples of good Muslims which intellectuals give are actually people who are considered as bad Muslims among their Muslim circles, and face constant criticism within their Muslim relatives for not being pious enough, but the same bad apples are presented as examples of good Muslims, just for the sake of winning debates with Hindus, whenever they are faced with tough questions about the intolerant practices in Islam. The best example of this Taquiyya is Abdul Kalam. Whenever you question an Indian Muslim about his loyalty to India, he will immediately retort “Muslims have done so much for the nation, take the example of A.R Rehman and Abdul Kalam, you cannot question our patriotism” but when no one is watching, the same A.R Rehman and Abdul Kalam are considered to be kaffirs as a matter of wide consensus among the Muslim society, as was evident from the number of people who attended the funeral procession of Yakub Menon and the (lack of) Muslims who attended the funeral of Abdul Kalam. But that doesn’t stop them from appropriating the legacy of Kalam, just to win arguments, despite the harsh fact that none of them ever eulogized him when he was alive, because Kalam is considered as a Hinduized Muslim. And by ‘Hinduized’ they imply ‘subverted individual’, who played veena, appreciated Indian classical art, made missiles for a ‘Hindu nation’ and was pro-Indian army. As per the Islamic doctrine, the only legitimate way to be a legitimate follower of Islam is to be an Islamist, there is no grey area here. As Turkish Erdogan said, there is no such thing as moderate Islam and radical Islam; Islam is Islam. This is probably the only truth he has uttered in his life! Islam is pretty clear in its doctrine that unless your body and resources are helping the political cause, you are of no use to ‘the cause’, you are just a Hindu with a long beard who calls himself a Muslim. Try this experiment once, go to a crowd of Muslims (preferably so called good Muslims as you call them), introduce yourself as a Muslim and tell them that you don’t support the Palestine cause, or Kashmiri nationhood and support the American war on terror. “Tumko koi kutta bhi nahi puchega”, you will immediately become a pariah in that group, despite being a Muslim. From their point of view, if you don’t support political Islam, then you are just a Hindu wearing the fancy dress of a Muslim. Let’s not forget, unlike the rest of the world, Muslims in India are ethnic Indians, who speak the same language as Hindus, who have similar cooking habits, similar dressing habits and everything is same, so the only way to retain and reaffirm their Muslimness is to reject their Hindu ancestry, otherwise they risk accepting that we are all the same people which in effect means that their conversion stands nullified. The only way to remain a true Muslim is to stay in the fight for Islamic supremacy over the world. So, this is a shape shifting multi-headed hydra which Hindus erroneously assume to be fading is actually growing, because you don’t understand how it operates. It has been growing ever since its inception, and will keep growing because Hindus don’t understand what kind of doctrine they are faced with. Can you give me an example of any person whom you consider good Muslim who is ALSO considered as a good Muslim by other Muslims? Is it Abdul Kalam? Tarek Fatah? 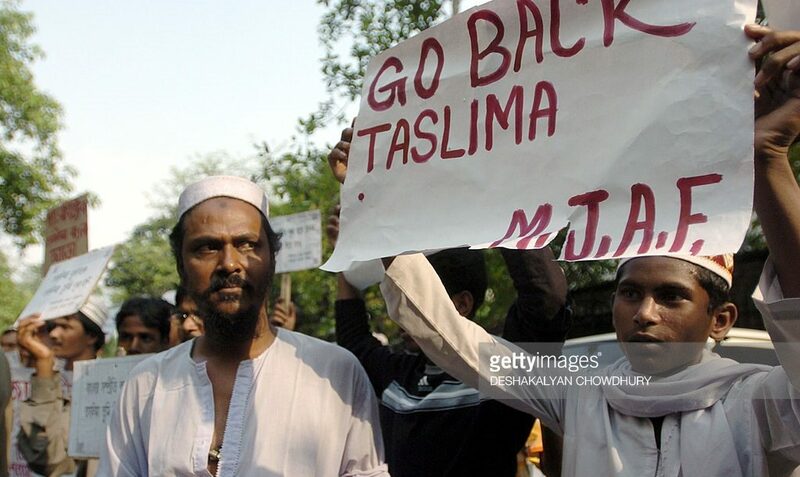 Tasleema Nasreen? and recently Irfaan Khan, are these good people? Yes they are, are they considered as good by the Muslim masses? No, they aren’t! So you see, the theory of there existing a majority of Indian Muslims who are good doesn’t hold water. The moment those people spoke the truth, they got labelled as kaffirs and ostracised from their respective Muslim communities, that is mainstream Islam. Therefore the claim that there is such a thing as Islamist, or Islamism, or any sort of dichotomy between an extremist or moderate Muslim is hogwash. Neither do the Muslims themselves believe in this theory, they go about pointedly following their doctrine without giving two hoots about what people think about them. It’s only the Hindus who put labels on them to get a false sense of security and NGOs like CAIR tap into this kaffir ignorance to coin terms like Islamophobia to put the majority in a perpetual guilt trap. If there are good Muslims, where were they when Talseema Nasreen was being hounded? Or have we made up our mind to delude ourselves by self-attesting that the existence of an outlier like A.R Rehman serves as a vindication for a normative theory which applies to 170 million Muslims. So basically, if one Muslim does something good, then all 170 million are to be credited for his actions, but if millions of Muslims are involved in acts of terrorism and sectarianism globally, it’s considered incorrect to extrapolate from that larger sample set? Where’s the sense of proportion here? Let me give you another anecdote, when people like Raj Thackrey make divisive speeches against others, his biggest detractors were Hindus themselves, and now his political fortunes have rightly been reduced to nothingness by the enlightened masses who rejected his divisive ideas. Why did this happen? Because there is a self-correcting mechanism within Hindu masses which comprehensively rejects violence. As opposed to that, the only way for a Muslim politician to win over Muslim masses and stay relevant in politics is to make divisive speeches, as is evident from the rise of Owaisi. So, where are these elusive good Muslims which Mindus keep talking about? I don’t see any, are they like unicorns or Schrodinger’s cat which disappear whenever there is a critical scrutiny? The reason Mindus get punked every time is because they keep correcting and criticizing themselves too much while there is no such mechanism within the Muslim masses, so their Islamist juggernaut keeps steaming on with scant regard for kaffir public opinion! Hindus are more committed to holding themselves to a higher standard than urging the Muslims to also subscribe to the same standard. And then Hindus are the ones who get lectured about intolerance, and by whom? Muslims! What a joke! Islamic terrorism has been going on for years but the jury is still out on whether using the term ‘Islamic terrorism’ is politically expedient or not, and one random dude gets killed in Dadri and no one bats an eyelid while terms like Hindu Taliban fly thick and fast! There are people claiming that Muslims are the one at the forefront of the fighting against terrorists in Syria and Iraq. Where? Are they fighting because they are opposed to violence in principle? Are they fighting to restore peace? They are only fighting a sectarian war because Shias and Sunnis both think they have a once in a lifetime opportunity to wipe out the other sect with the help of powerful benefactors (Iran and US respectively). Were they pained when their terrorist gangs terrorized non-Muslims? What status quo are they trying to establish by their alleged ‘fight against terror’? What is the end goal of their fight? Is it to establish peace and brotherhood? There is no point in deluding ourselves. The only time Muslims claim that Islam is a religion of peace is after a terrorist attack, and there is nothing inherently wrong in that, except for a small nuance of who the message is targeted towards. Is it addressed to the millions of Muslims who are actively engaged in terrorism? Or is it addressed to kaffirs to shut them up? It’s rarely the former. I mean, all the moderates who suddenly pop up on social media reaffirming the peaceful nature of Islam aren’t using it not to educate misguided Muslims (as they call them) but to shut down any criticism originating from kaffirs. Given a choice between telling that ‘Islam is a religion of peace’ to Muslims who apparently have forgotten it OR telling it to kaffirs who don’t have any use of it, which one is your priority? If it is the latter then even you are a part of the ecosystem of deniability which is built to shield terrorists from criticism. If terrorism truly has no religion, then one can only hope that someone tells it to the millions of Muslims engaged in terrorist acts all over the planet, maybe they missed the original memo. ← Is US ripe for people’s revolution?